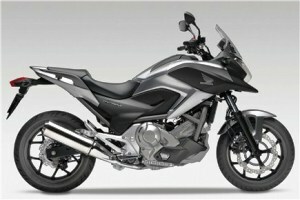 After almost a decade of being asleep on the job, Honda has risen to the challenge and once again created a multi-purpose motorcycle that will satisfy long time loyalists as well as new riders. The NC700X combines simplicity with versatility at a price point no one can argue. The basic 2012 model, clocking in at just under $7k, is hard pressed to show you just what it is. Is it an ultra light sport touring mount, a street standard, a wolf in sheep’s clothing or a dual sport for the easy-breezy pea gravel set? Hard to say, but our tests confirm it’s a bit of all that. For years it’s been obvious that Honda missed the boat entering the dual sport adventure market in the US. But the fact is, they were actually there in 1988 when they introduced the NX650 and Transalp models. However, neither model sold well and Honda closed up shop on the adventure bike market for the US by 1990. Several years later, BMW launched the Funduro, aka the F650, and the market got hot fast. In the early '00s Suzuki introduced the V-Strom. A tad more hefty than the F650s, but as many riders proved it would serve its purpose on pavement and gravel. So where was Honda? In 2009 Honda introduced its European wonder, the Varadaro, to the Canadian market and got it DOT approved for the US market, but it never saw the light of day here. Meanwhile, back in R&D, a design team took the motor used in the Fit (Honda's current compact car), essentially cut it in half and developed what would be the first adventure bike from Honda to see US shores in more than two decades. It’s been a long wait, but the wait was worth it. The bike has become a best seller, not only here in the Northwest but around the world. Within a few weeks after its late July release, dealers were out of stock on the base model and waiting for their fall allocations to meet customer demand. It’s been a long time since Honda has had a best seller like this—especially in an under 1,000cc class model. The NC700X features a parallel twin with a long bore, which means it’s happiest at lower RPMs. The sweet spot is between 3000-5000 rpm. The bike red lines at 6,500 rpm and lets you know when you get there by intermittently cutting out, abruptly sending the rider a few inches forward as a result. There’s simply no need to go there. The 10.7:1 compression ratio is a little lower than an inline four, requiring more use of the brakes when cornering rather than relying all on compression. But the transmission and motor make up for these two negatives by providing a smooth ride, a really nice motor tone and awesome gas mileage. We averaged 65-67 mpg for the first 2,000 miles. We like the stock exhaust. It's so quiet you can't hear the bike on the highway, you can only feel it. When you can hear it, it's got a sweet large feline purr similar to the old PC800s Honda produced. A smart, lighter design features a large single Wave rotor for the front brake, and a smaller disc for the rear, resulting in plenty of stopping power. Suspension on our new model was a bit stiff for starters, but got comfier once the bike passed the 2,000 mile mark. Honda doesn’t provide a tool for adjusting the rear Pro-Pink shock and makes no mention about doing so in the manual, other than advising you to go see your dealer. Overall Handling of the bike is awesome. The bike got a spin down the east side of Mt. St. Helens, a road we know all to well from putting on our Rally in the Gorge. Oh My! From Randall to Elk Pass was a dream. The bike made every corner seem easy, even those with frost heaves. From Elk Pass to Muddy River, the bike showed it's lack of compression, but using the brakes minimally accomplished what we were looking for in smooth corner transitioning in and out. It's just takes a few time to retrain the brain function if you're used to an inline four. As with most bikes today, there is no tool kit on board per say, but you can craft your own out of a CruzTOOLS Road Tech M3 kit. Just disregard the unneeded items to lighten your load. A full list is included on the useful NX700X/NC700S forum online (www.nc700-forum.com). The look and overall design of the bike is almost futuristic. You’re not getting has-been technology or old school lines here. Instead you’re getting a bike that is going to look as good in 10 years as it does today. The functional 22 liter storage compartment where the gas tank would go makes a lot of sense, and allows for storage of heavier items like an air pump, tire repair kit or water, to keep the CG of the bike low. Our one gripe—the 2012 model only came in Silver for the US market. More on that in a moment. Ergonomics are excellent. The bike was a good fit from the get-go. With a 30" inseam I was able to get both feet on the ground comfortably, and maintain a 15% bend in my elbows while holding a straight up and down perpendicular position while riding. No need for bar risers. Just what everyone who rides 200 plus miles at a time wants from a touring motorcycle. Does it go off-road? The question on every dual sport rider's mind. Initial Honda advertisements of the bike showed it parked on pavement with a dirt road behind it. But with Bridgestone BT 023 Sport Touring tires installed from the factory, the bike proved to be unhappy when ridden down the gravel FS 9712 road from Blewitt Pass to Liberty near Ellensburg. It seriously needs 80/20 tires if someone wants to go off-pavement with it. While the NC700X is a great bike out of the box, there’s plenty of room for improvement based on a rider's tastes. We went to work on ours before it even rolled off the showroom floor. Elite riders say that you should plan to spend as much as you paid for the bike in add-ons after you buy it. Now—that’s the elite talking. For the more frugal you can cut that price tag down. But remember, the NC700X is only $7k unless you sprung for the DCT/ABS version which runs another $2k. When we ordered our bike, we went ahead and added a top box and side cases to the order. After all, you gotta have some space to store everything, and the Ortlieb bag is getting a little old and it’s always been cumbersome. Honda worked together with designers at Givi to create some almost gothic style side cases. The thinking that went into the actual functionality of the cases is worth applause as well. They’re easy to attach and un-attach and come with a tumbler kit so you can key each one to the ignition key—nice. For some reason, they designed the top box to use its own smaller key. OK, so you still need an extra key. Not a big deal. Other aftermarket companies are creating racks and cases for the bike, but we think the Honda/Givi one looks the best and provides plenty of storage space. Storage capacity of the top and side cases combined with the storage up front comes to a whopping 124 liters, far more than any practical touring rider would ever need solo. Every motorcycle is a good motorcycle … as long as it’s yellow, right? Whatever your color preference is, unless you like silver you'll need to tear off the body work and take it to the painter. You’ll be much happier! We had our unit broken down and painted before we ever took final delivery from the dealer (at which point the luggage had been mounted as well). There’s no way you’re going to want to spend much time on a fire road with those slippery BT 023 tires. Off ours went to Craigslist, and on came a set of Avon Distanzia 80/20 Dual Sport tires. The bike had a revelation indeed and performed much better off-pavement. We toured it across the CG's (county gravel) along the Nez Perce reservation in Idaho, then ran it across FS29 in the Olympic National Forest. The results are what we think Honda might be looking for in the long run from this bike. Stock seats are for the birds. Seems they don’t fit anybody. Ours was such that the inner thighs were feeling excessive strain. A trip to Rich’s Custom Seats in Kingston resolved the issue by providing better overall support. The leather covering will last far longer than the stock vinyl. Because the bike requires chain maintenance, it’s not a bad idea to get the center stand accessory. Ours is on order, but they're hot so we won't see it until November. To date, more than a half dozen aftermarket manufacturers offer large wind screens. We tested moving the stock wind screen 1 inch upward. Bad idea. The bike became unwieldy at 60mph and it was all we could do to get the wind screen back into its OEM position. Obviously Honda wind tunneled the bike during design and found this to be the optimal position. Adding any height will reduce controllability. Nonetheless, if you must have a larger wind screen, we suggest you go with Honda’s since they probably put that through some wind tunnel testing before deciding on the final design. We didn’t get those funny metal plates you affix to the luggage. We think they steal from the more stealthy look you get with the basic black bags. The last word - If you're looking for a nice bike that functions equally well as a sport touring mount or a dual sport on pea gravel, the Honda NC700X is certainly worth checking out.